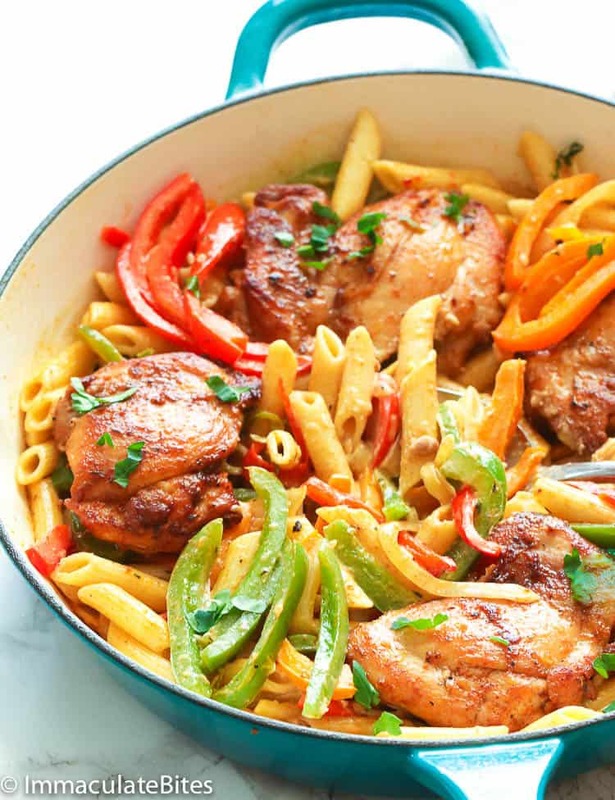 Rasta Pasta – a Jamaican-inspired one-pot dish with creamy cheesy pasta tossed on top with jerk chicken and bell peppers. Creamy, cheesy and spicy! This post is sponsored by Café Appliances. Customizable appliances for modern day cooks. Design your appliances around your style. A couple of my girl friends from other parts of the U.S. drove down the L.A traffic just to visit me. Aren’t they sweet? And one of them brought along with her this Rasta Pasta recipe that she got from her Jamaican mom. But this time around, I put my own little spin to it. While I’d love to think that I’m the best cook among our group (sorry, ladies :p ), but these fellas, can roll up their sleeves and nail some dishes, too. But the star of the show on that day were my upgraded kitchen from @CafeAppliances. My kitchen experience gets a lot more exciting as I discover new features from our kitchen appliances every day. I’ve talked a bit about my Café Appliances Wall Oven and French Door Refrigerator with Hot Dispenser HERE. They are all amazing so far! 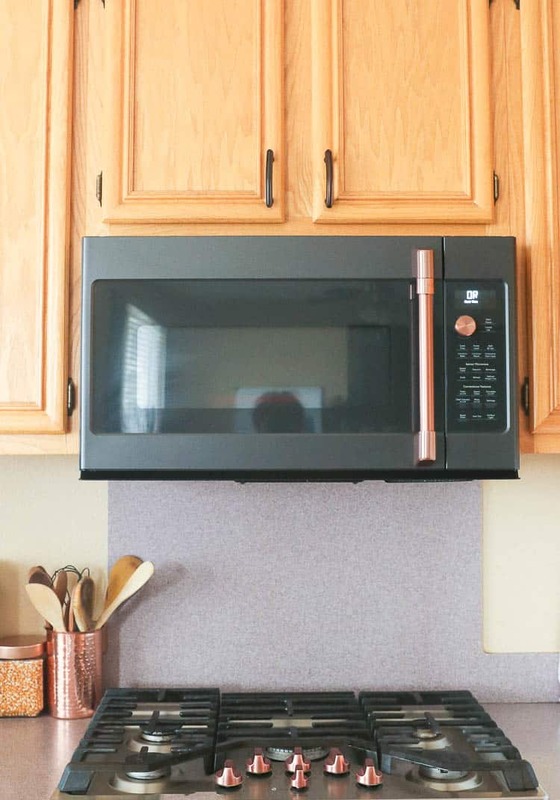 I love the idea how I went through the process of planning my kitchen mood board back in December before I decided to go with Matte Black finish and Brushed Copper accents for my appliances. They look neatly tucked in my kitchen with its built-in look and in harmony with my home interior with its customizable knobs and handles. And you can easily change these accents too like your jewelry to match or contrast your interior and your current mood. Now let’s talk about this over-the-range microwave oven which we haven’t used that much until recently. We rarely use our old microwave oven, but with this new one, we’ve been using it more often for popcorns (Hello Friday movie night! 😉 ) and steamed veggies (hubby sure love this one). Now take note of this, it automatically adjust time and power for that perfectly cooked dish, especially when reheating dishes. It delivers dishes as good as those baked in the oven with its full-width removable cooking rack that also allows cooking simultaneously. Well, honestly, I could dedicate an entire blog post about this exciting cooktop. I swear! Our old cooktop was slightly bigger than this one but it only has 4 burners. 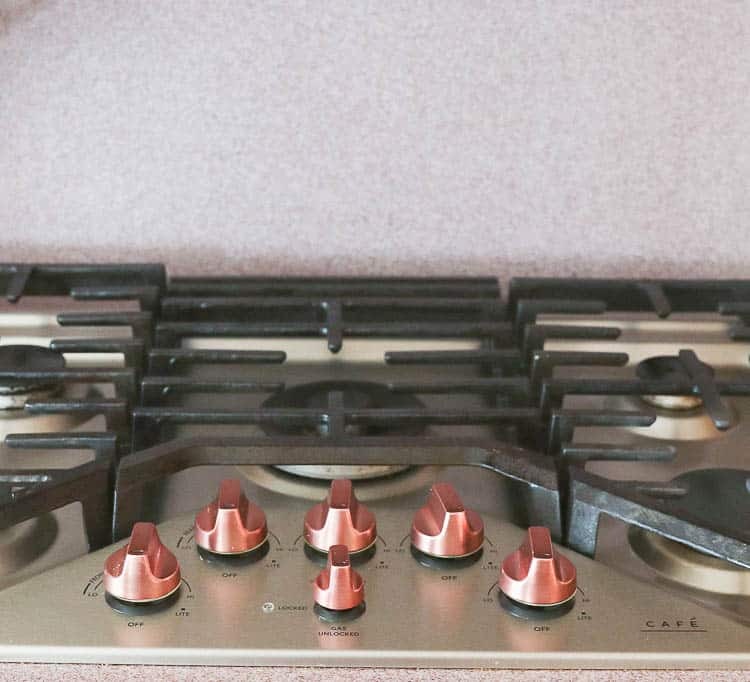 This baby right here though has FIVE (5) burners with Tri-Ring burner that are perfect for searing and sautéing. Delicate food are evenly heated on this cooktop even on low heat. And not only that, it also has heavy duty STYLISH knobs with LED backlit (gorgeous, right?) that glimmers when its in use. How AMAZING is that? But what I do love most about it is that it has an extra large integrated cooktop griddle which makes perfectly cooked pancakes (which my son loves), eggs, patties, and pressed sandwiches. Just imagine this…I can boil the pasta and sear the chicken on the cooktop at the same time while I prepare the crab cakes on the cast-iron griddle. Lastly, with its sealed cooktop burners, it contains any mess or spills during cooking, and make cleaning up so quick and easy. The heavy-duty grates are dishwasher-safe, too! Cooking and entertaining has never been this easy! To learn more about Café Matte Collection, please visit their website at www.cafeappliances.com or check out their gorgeous boards on Pinterest. 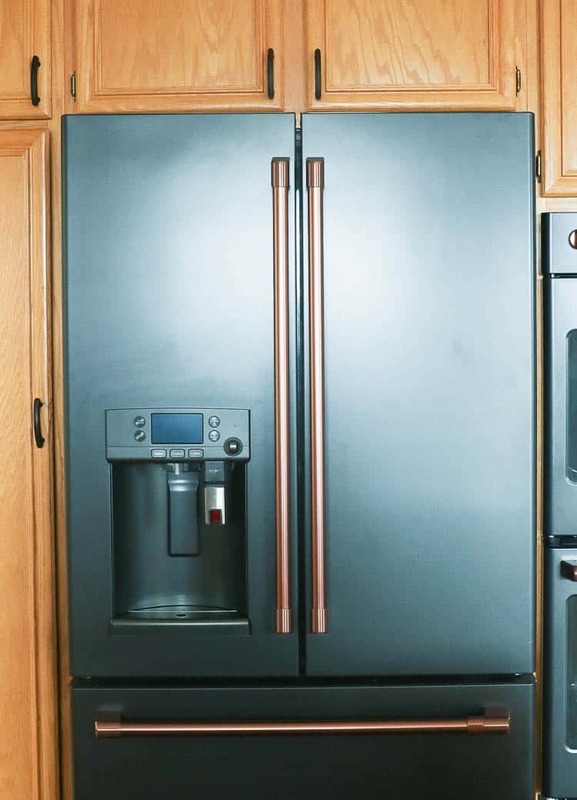 You can also check out more of their appliances in action using #CafePartner, #CafeCollective on Instagram and see some kitchen inspirations. Rasta, in short for Rastafari or Rastafarianism, is a belief and lifestyle that originated in Jamaica during the 1930s and they have since spread throughout the Caribbean and even to the rest of the world. 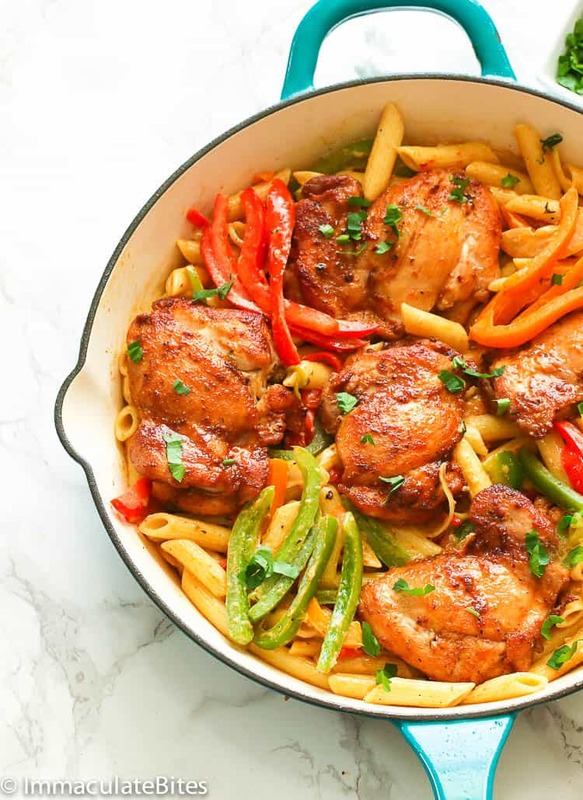 This Jamaican-inspired one-pot meal Rasta Pasta is a simple yet decadent dish that’s great as a family weeknight meal or for entertaining. 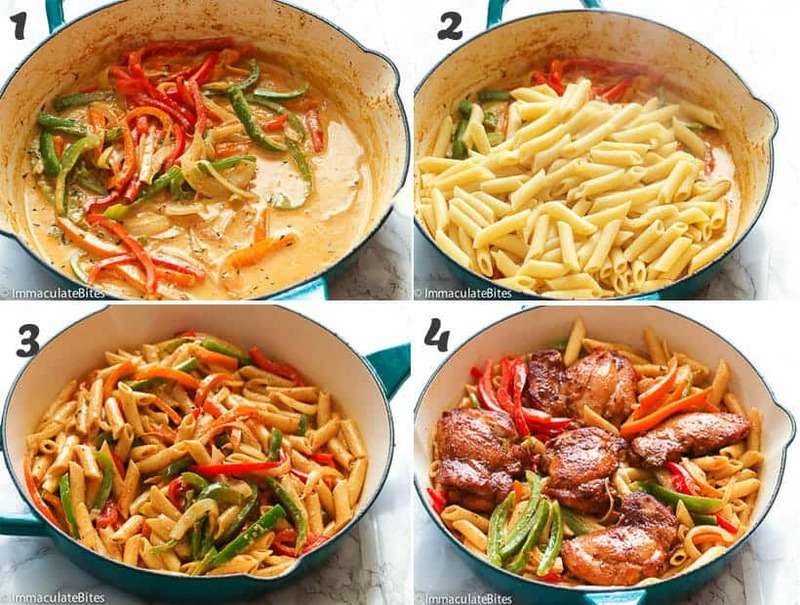 Over the years, it has evolved from a simple pasta veggie dish with coconut-milk based sauce to a creamy, cheesy, pasta veggies with jerk chicken and/or shrimps. But even without the meat, Rasta Pasta alone is a decadent meal with its creamy sauce. 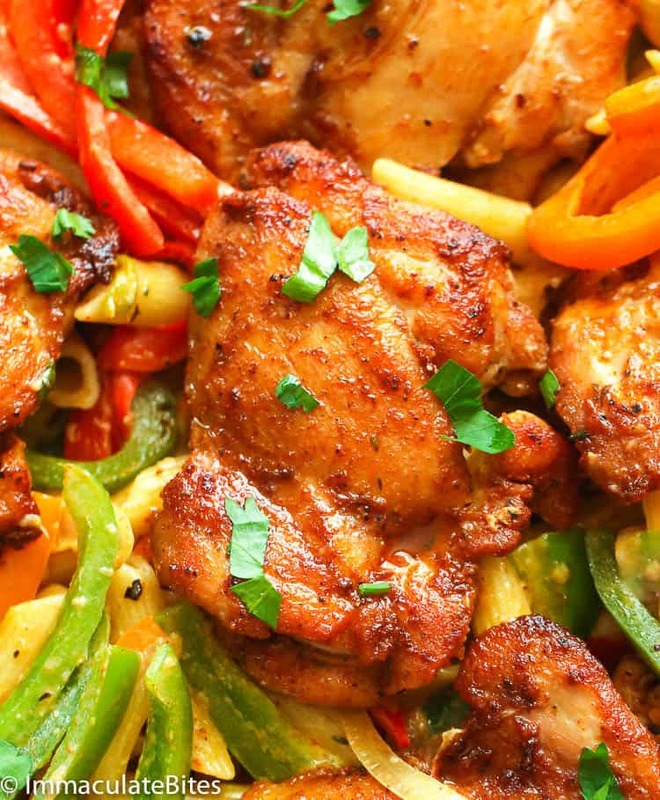 Other than the name, what makes this dish more Jamaican-inspired is by seasoning my chicken with my homemade jerk seasoning which brings depth of flavor to the meat. 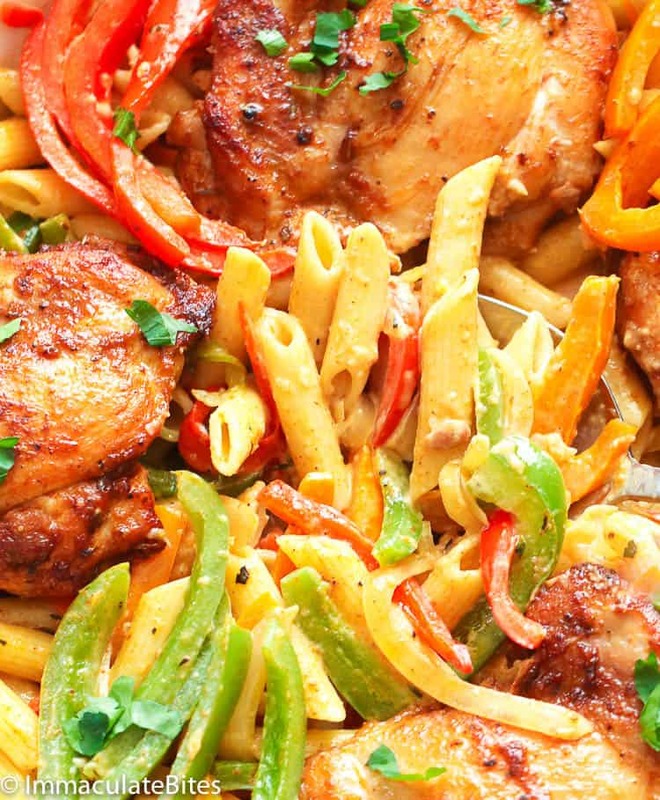 You can make this jerk-seasoned chicken ahead of time and just toss it over the pasta. Or you can serve it on the side if you want to. What ingredients are in a Rasta Pasta? Classic Rasta Pasta would use coconut milk as a base for the sauce, however, since I want that chicken flavor to linger more in the pasta, I decided to use heavy cream to go along with the chicken stock. Personally, Parmesan cheese pairs well with a heavy cream-based sauce than that of a coconut milk. Furthermore, since not all of our readers here can easily access Parma Rosa sauce mix (another ingredient in a classic Rasta Pasta), I left it out and adjusted the sauce to somehow mirror that cheesy, creamy, with a hint of savory and heat. And it turned out great! Everybody loved it and it’s even approved by my Jamaican friend. You may add shrimps into this or even sliced oxtails! As always, adjust the creaminess and heat based on your preference. 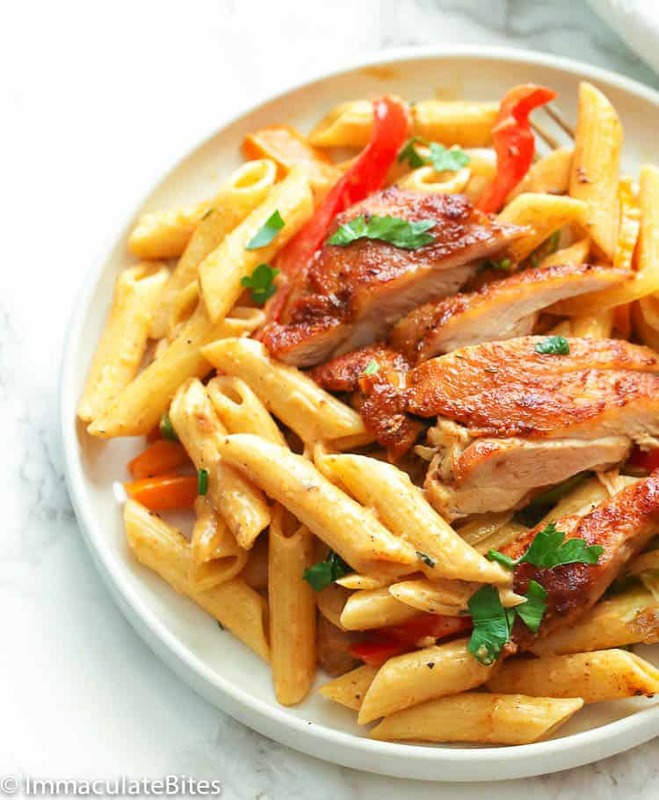 Ever since that little gathering, I’ve been making this easy and amazing Rasta Pasta dish almost every other day and I don’t think I’ll be stopping soon. It quickly flies off the table and just as appealing to the little ones. Now I have more reason to schedule a little gathering in my house more often; I got a crowd-pleasing recipe and a set of customizable and efficient kitchen appliances . 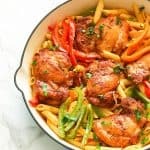 Rasta Pasta - a Jamaican-inspired one-pot dish with creamy cheesy pasta tossed on top with jerk chicken and bell peppers. Creamy, cheesy and spicy! Cook pasta in a large pot, according to box instructions. Salt according to taste, drain and set aside. Heat a heavy cast iron skillet over medium high heat. When the pan is hot, add about 1 tablespoon of oil to cover the bottom of the pan. Using a thong, add in the chicken and sear both sides until golden or until fully cooked through and juice from the chicken runs clear, about 8-10 minutes on each side, depending on the thickness of the chicken. For faster cooking you may cut chicken in bite size pieces .Remove from the pan and set aside. Add remaining oil to the pan, cook onions, garlic and thyme stirring for about a minute until onions is soft. Then add in bell peppers, cook for about 2 to 3 minutes stirring occasionally. Season with paprika, Worcestershire and the remainder of the jerk spice. Finally toss in pasta and with sliced chicken or serve with chicken on top , like I did. Sprinkle with green onions and/or parsley. Adjust heavy cream to desired thickness. Use an extra ½ cup or more for creamy pasta. You may omit completely and replace with an extra tomato. Cook pasta in a large pot, according to box instructions. Salt according to taste, drain and set aside. 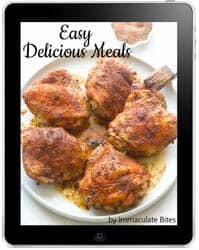 Place chicken thighs in a medium bowl, then generously season the chicken with salt and jerk seasoning, making sure all sides of the chicken are covered with the spice. Cover chicken with a transparent plastic wrap and let it marinate for about 30 minutes or up to 24 hours. Heat a heavy cast iron skillet over medium high heat. When the pan is hot, add about 1 tablespoon of oil to cover the bottom of the pan. Using a thong, add in the chicken and sear both sides until golden or until fully cooked through and juice from the chicken runs clear, about 8-10 minutes on each side, depending on the thickness of the chicken. For faster cooking you may cut chicken in bite size pieces .Remove from the pan and set aside. Finally toss in pasta and with sliced chicken or serve with chicken on top , like I did. Sprinkle with green onions and/or parsley. Will try tonight. Look very tasty. Can you please publish the old vegetable version of Rasta Pasta with coconut milk? Will add that on my list. Thank you!